Step-by-step Introduction to HTML and creating a simple page. Codrops is a web design and development blog that publishes articles and tutorials about the latest web trends, techniques and new possibilities. HTML5Demos showcases some of the features of HTML 5 using real world examples. Demos include drag and drop XHR uploads, streaming video with canvas, a simple chat client and more. You can also find out which browsers support what feature. Winithemes is one of the biggest online collections of professional templates for Wordpress, Joomla, Drupal, HTML, Magento, OpenCart and other popular platforms. Currently, it is listing more than 7000 premium themes. Caniuse helps you find out which browsers support what features. Type in a feature (such as border-radius) and Caniuse will output a table showing which browsers support that feature. Radiant CMS is an open source content management system (CMS) (built on Ruby on Rails) designed for use by small teams. The site includes downloads, extensions, a development community, a weblog, podcasts, etc. Doodlekit is a free website builder. Easily build your own site. No coding required. Features include creator design tools, domain registration & site hosting. Updates available anytime from anywhere. Weebly is a drop & drag website creation site. You can quickly and easily build a free personal or business website using the theme templates and content elements (i.e. text, photos, maps, videos, etc.) provided. 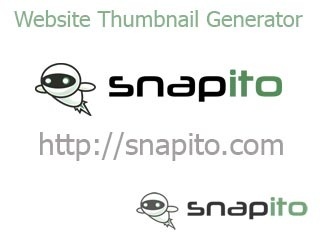 SnapPages is a website creation site for the novice or newbie. The drag and drop tools make building your site easy to have up in not time at all. Free (personal) version comes with five pages, 1 GB of storage, photo gallery, contact form, etc. 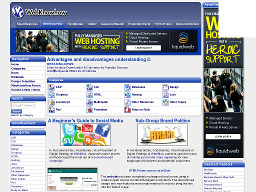 WebmasterSolution.com WebmasterSolution.com offers a variety of resources for webmasters ranging from articles and tutorials to free online tools and a link directory. 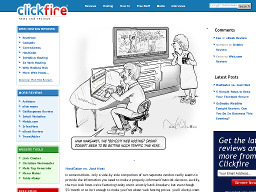 ClickFire.com An interesting hodge podge of webmaster tutorials, apps, articles, tips and more. This is the kind of website that needs to be explored to find the goodies. News4Sites.com A news content site for individuals, webmasters, companies and ISP's. The site monitors news on more than 8,000 web pages from 2500 domains and delivers over 25,000 news headlines everyday. Both free and paid newsfeeds are available. 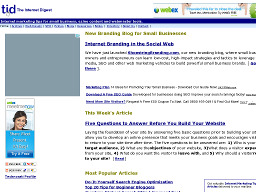 The Internet Digest A great content site with useful articles, reports, resources and tools for webmasters. Definitely worth a visit.